Eating a handful of Walnuts a day is said to increase the good cholesterol (HDL) in your body. HDL helps remove bad fats from the blood. In general, walnuts, cashew nuts, peanuts, almonds, pistachios, and pine nuts are a healthy snack to carry keep with you as they are rich in monounsaturated fats and polyunsaturated fats. Walnuts, in particular, are a rich source of Omega 3 Fatty Acids which are healthy. Perfect to eat a mix of them or try different nuts each day for your Heart. Walnuts are rich in Manganese and help the body in maintaining healthy bone structure by helping in making enzymes needed to build strong bones. Walnuts are also rich in Phosphorus which helps build bones. Walnuts are rich in Magnesium which improves insulin response by lowering insulin resistance. Having very low magnesium will result in the pancreas not secrete enough insulin to control our blood sugar. So Walnuts are a Diabetic’s friend. Walnuts also contain Arginine, an essential amino acid, which is converted into nitric oxide, a chemical that helps keep the inner walls of blood vessels smooth and allows blood vessels to relax thus helping relieve hypertension issues. Peanuts, Almonds, Walnuts, and Cashews are rich in Protein and healthy monounsaturated fats which won't spike your blood sugar levels. They are a healthy snack for Diabetics and good to carry a handful with you when you are traveling. A handful of Walnuts will give you 4 grams of Protein. Walnuts are a powerful Antioxidant which fights free radicals and slows down inflammation in the body due to the eating of processed foods and external toxins. Being a good source of Folate, Vitamin B9, its good for pregnant women to top up their folic acid with eating a bit of walnut daily. Walnuts are rich in Omega 3 Fatty Acids which contain high amounts of DHA which improve thinking power in adults and excellent for brain health for newborn kids. 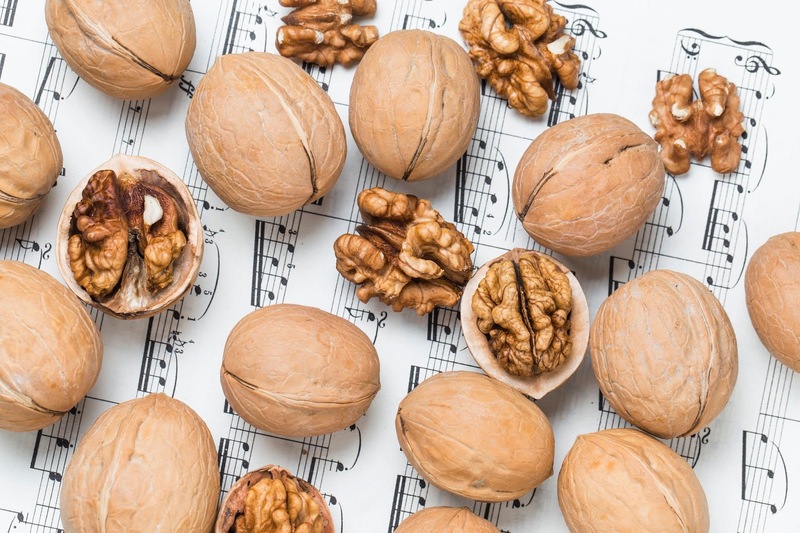 There is a common saying to have your walnuts to increase your brain power. Walnuts contain Melatonin, an Antioxidant which helps in making you sleep better. So pop a handful or less of walnuts before you sleep at night. For those on a Low Carbs diet, Walnuts are the perfect answer. A handful of walnuts has only 3 grams of carbs.